Run, walk, bike, or swim and help fight childhood cancer. When you join ALSF’s charity racing team, you’ll raise awareness by wearing one of our fantastic Team Lemon shirts at a race of your choice. There are two easy ways to join Team Lemon! If you’d like us to provide your race slot, choose one from our list to join Team Lemon! We’ll send you information about fundraising and connect you to our race coach! If you’ve already registered for a race, click here to join Team Lemon! A Team Lemon t-shirt to show you’re part of the team. Personal Training Assistance: Access to Team Lemon’s coach, customized training plan, be partnered up with others in your area, and connect with other Team Lemon athletes through our Team Lemon private Facebook group. Fundraising Support: Free fundraising kit available when you register, ongoing communication with our fundraising coach, access to a publicist and social media specialist to help you spread the word. We’ll provide you with an online fundraising page which makes it easy for you to receive donations online, track your progress, post photos, blog about your training and share updates with family and friends. Discount at Alex's Shop: Save on merchandise, including performance shirts, hats, water bottles and more. Team Lemon is the endurance fundraising team for Alex’s Lemonade Stand Foundation (ALSF). Athletes can join Team Lemon and raise funds for kids fighting cancer, while being coached to fulfill their own personal goals. All funds raised by Team Lemon participants go directly to Alex’s Lemonade Stand Foundation for Childhood Cancer Research, a registered 501(c)3 charity. Careful distribution of our childhood cancer research grants allows doctors to bring the latest and most promising lifesaving treatments to seriously ill children. These grants provide hope for childhood cancer patients. Visit our Where the Money Goes section to learn more about how your donation helps. What sports can I participate in as part of Team Lemon? Team Lemon athletes run, walk, bike and swim (or a combination of all!) for endurance events, from 5K & 10K races to marathons and triathlons. It’s not just limited to races…Team Lemon members also register for other activities like a long distance hike through the Grand Canyon! Is it fun being on Team Lemon? Yes! 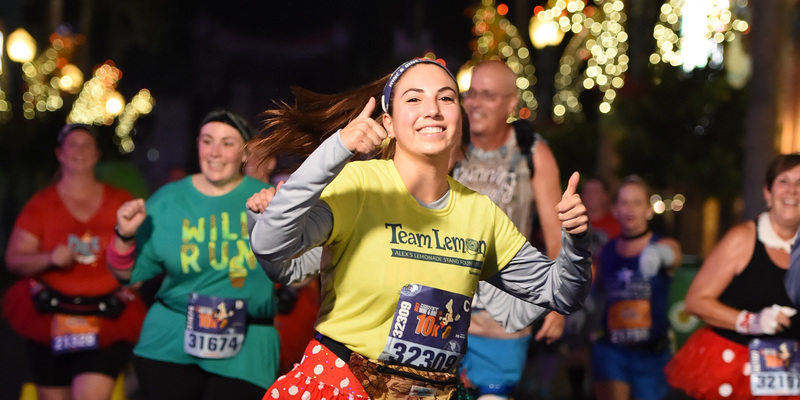 Being a part of Team Lemon allows you to have training and fundraising support for the sport you enjoy and feel great about achieving your goals. It’s also inspiring to know that you’re helping kids fight cancer. I have never run a race before, can I participate? Of course! ALSF welcomes everyone to join Team Lemon. With hard work and determination, you will reach your goal and finish your race. Many first-timers have done it successfully and signed up for more races. Do I need to be fast to join Team Lemon? Not at all. Team Lemon welcomes athletes of all ability levels. How do I apply for Team Lemon? 1) Register for any race on your own and then apply to be part of the team. You will receive a Team Lemon shirt, incentives for fundraising, coaching and more…all with no fundraising minimum! 2) You can apply for one of Team Lemon’s race slots that are currently available. You can find an updated list of races here. These races have a fundraising minimum, but also allow you to participate in popular races that are otherwise sold out. I want to apply for one of the race slots you have available. What will my fundraising minimum be? Fundraising minimums vary by race. For information about the race you are interested in, click on the application for that specific race. Your fundraising coach will work with you to help you achieve your fundraising goal. How do I register a fundraising webpage? BYO participants - Click here to create your page. Participants who apply to a race slot - After your application has been processed, you will receive a specific link to register the page. You will also have the option to create your page as a “team page” so that other members participating in the race can join your team page rather than create their own team. Your fundraising page is a great tool to not only raise funds leading up to your race, but also to let friends and family know about your training and experience. I am planning on racing as part of a team. How does this impact my fundraising minimum and incentives? If you cannot participate in your race for any reason and you have signed an agreement with ALSF/Team Lemon to reach a fundraising minimum, we require that you raise the minimum amount. This is because current race partners do not allow Team Lemon to transfer entries. As a thank you for raising the minimum amount, you will be given first preference/choice of an entry in the following year’s race (same race) unless otherwise agreed upon by ALSF/Team Lemon. If you drop from the race for any reason prior to the race registration deadline, you are not required to meet the fundraising minimum if an alternative runner can be found by ALSF/Team Lemon. The alternative runner must register in your place before the race registration deadline set by the race partner.